Today it's my pleasure to introduce Australian author, Janeen Brian, to The Book Chook. Although this is the first time Janeen has shared an article with us, you've seen my reviews of her books, like Hoosh! Camels in Australia, Shirl and the Wollomby Show, Machino Supremo, I Spy Mum and many more which you can link to via my review of I Spy Dad. I'm thrilled to have Janeen here today, sharing some insights into her writing life and telling us about the stories behind the stories she writes. For more insights, check out her blog, Janeen's Jottings. Janeen began writing soon after she turned 30 when she wrote small poems for her two young daughters. Although the writing bug began to bite, it only nibbled spasmodically, and it wasn’t until several years later that she began to have work published with an educational publisher. A background in teaching helped Janeen understand the philosophy of what was needed, although she still had much to learn about the craft of writing! Some 30 + years later, she has over 70 books published, many translated into other languages and many, like Where does Thursday Go?, Hoosh! Camels in Australia and Pilawuk: When I was Young, winning awards. 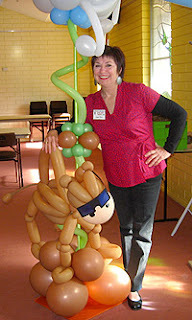 She also writes stories, poems and articles for children’s magazines, both in Australia and overseas. Apart from being a fulltime author, Janeen loves to read, create mosaics from recycled materials, grow food and flowers in her garden, go to theatre and films, travel, attend several fitness classes and of course, spend time with her family and friends. Every book has its own story. The one the author intended to be read. But what are also fascinating are the countless mini-stories that occur as you, the author, create that one book. Creating books lend itself to all sorts of serendipitous happenings, in all forms. Have you ever discovered a piece of information that seems to have been sitting around simply waiting for you to unearth it? Has there been an odd comment uttered innocently in an everyday conversation that somehow gave you a whole new slant on your life? Or have you discovered an object that evoked an idea - or was perfect in some other way? Claire Saxby once found a soft toy, blue whale in the gutter. She’d searched seriously in shops and other venues for just such a thing to use in an activity for her picture book, There Was an Old Sailor, but had had no success. What are the chances of that happening? These mini-stories are endlessly fascinating to us as writers and readers. They’re like barnacles that adhere, one by one, to the main jetty pole, adding to its shape and texture. But equally intriguing is: what happens to our books afterwards? I don’t necessarily mean at the launch or during those rigorous inroads of self-promotion. I mean the ones you don’t expect, the the surprises that add another layer or two to your fully completed written book. Perhaps you never expected your book to turn up written in Braille? Or that your story would become a film. Or that a letter arrives from a stranger, explaining that your book was the first one their child had read from beginning to end. My camel books, the award-winning, information book Hoosh! 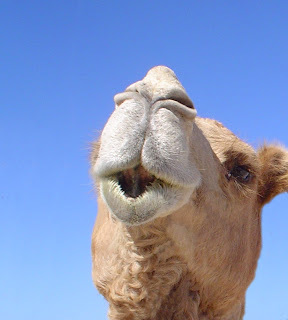 Camels in Australia (ABC Books, 2005) and the picture book Columbia Sneezes! (Omnibus/Scholastic, 2008, illustrated by Gabe Cunnett) now have several such legacies. As such, they have consciously or subconsciously enriched the book for me. They’ve also demonstrated that while the books themselves are tangible and complete, they still pulse with possibilities. Let me share a couple of afterwards stories with you. During the research of Hoosh!, I was extremely grateful to the knowledge of Peter Seidel, Executive Officer of the Central Australian Camel Industry Association. He answered zillions of my layman type questions by phone or email, met me in Adelaide for an interview and provided me with industry information and photos. After the book’s publication, Peter proudly offered Hoosh! as a business gift, to many of his clients in US, Japan and Saudi Arabia, buyers of fine, disease-free Australian camels for the prestigious camel racing circuit. Hoosh! also found a place in a display case in the South Australian Museum travelling exhibition called Australia’s Muslim Cameleers; Pioneers of the Inland, 1860s – 19303. The exhibition has travelled to many capital and regional cities in Australia since 2007 and is still on the move! A copy of Hoosh! was placed in a little travelling bag, organised by the Quorn School Community Library, to celebrate ‘Reading @round the Region' in 2006. The bag also contained other camel bits and pieces such as the picture book, Little Humpty, photos from Pichi Richi Camel Tours and a pattern to knit a little camel, like Clive! This ‘camel bag’ was sent to outback and remote schools and libraries in the far north of SA for children and parents to use in their reading time. In 2006, Hoosh! brought home an Honour Award in the Eve Pownall section for Information Books in the Children’s Book Council of Australia Awards. Later young children devised a song with a string of verses, each including a fact discovered while reading Hoosh! Hoosh, the camel, has one hump. And from Hoosh! evolved the picture book, Columbia Sneezes! It grew from a story devised by my grandson and I about a little soft toy camel I’d bought while doing fieldwork at The Voyages Camel Cup in Alice Springs. Columbia spawned an amazing camel construction made entirely of balloons at the CLIC (Children’s Literature in the Centre) Festival in 2008! And a permanent sculpture is to be made of Columbia and set in a Storyboard Walk in a park in South Australia. None of these eventualities could’ve been foreseen. But what joy it is to see your work remain malleable and to appear in various ways and venues previously unimagined. All our lives are made up of stories. We live by narrative. Stories shape us, guide us, and entrance us. ‘Once upon a time’ will always remain magic words –for the first story or the countless others that follow! And the greatest joy continues to be knowing that I've played a part in encouraging kids to love reading.